This time last year, we were in the throes of a total kitchen remodel and my kitchen was nowhere ready to be decorated for Christmas. Shoot, I was proud of myself for even managing to get a Christmas tree decorated and the presents wrapped! But I’ve made up for it this year. There is barely a corner of my kitchen that didn’t get a little Christmas love. …and the breakfast area at the other. We have two turrets on the back of our house, which I love, and the breakfast area sits in one of them. The window gives us wonderful panoramic views of our backyard where we frequently are treated with deer trotting by. I’ve never shown my breakfast area in its entirety before as there was always some project or other that wasn’t finished. But everything has been completed in that area now, including window treatments, new diy rustic shelves above the sideboard and a new light fixture. We’ll look at more of the breakfast area in a minute. First let me show you around the functional end of the kitchen. I”m enjoying the first Christmas in our remodeled kitchen so much that I couldn’t help but take a lot of pictures. So grab a cup of cocoa and sit back and relax because this is a photo heavy post! A garland added to the vent hood above my cooktop was my jumping off point. Tiny battery operated lights add just a bit of sparkle. 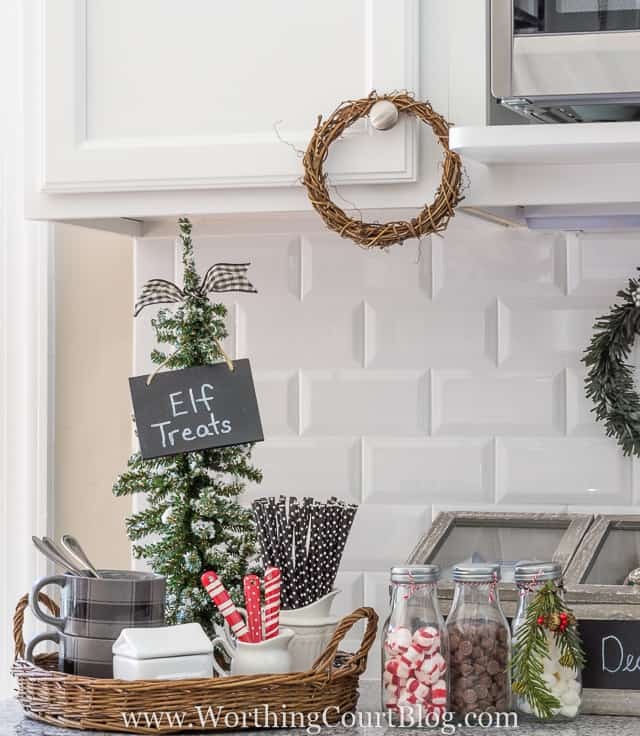 I mixed in Christmas touches with the everyday items that live on my kitchen counters all of the time. Touches of black and white ribbon were worked in all over the place. In fact, I bought every single roll of black and white checked ribbon that two different Michael’s had! Love that stuff. Small pops of red were added here and there to bring it all to life. I love the mix of rustic and elegant in this wooden box that holds a bit of my gold rimmed Christmas china, along with some sentimental cookbooks and a rustic star. The island sports a squatty snowman on a red sleigh and a couple of snow laden trees. The other side of the kitchen, opposite the sink, is where the ovens, microwave and pantry are located. You might have noticed that that’s where the most important thing in the kitchen is located too. The coffeepot. For our upcoming Christmas family gathering, I set the entire area up as a hot drink bar. The long container in the center has a space for cocoa pods as well as regular and decaf coffee. Now onto the breakfast area. You may have seen that I shared my brand spanking new diy rustic shelves a few days ago. Nothing really changed on them, except that I added a glittery Merry Christmas banner and a few red touches to tie in with the rest of the kitchen. I’m still trying to decide if the banner is overkill, but the more that I live with it, the more I like it. What do you think – too much? I won’t spend a lot of time on the shelves today since this post is already so long, so click HERE to take a closer look at them. I mentioned earlier that I had made several changes in this area of the kitchen. It sure has come a long way since we first moved in a little over a year ago. I’ll be doing a separate post later to go over the details. In the meantime, I’m loving the view from my spot on the couch. 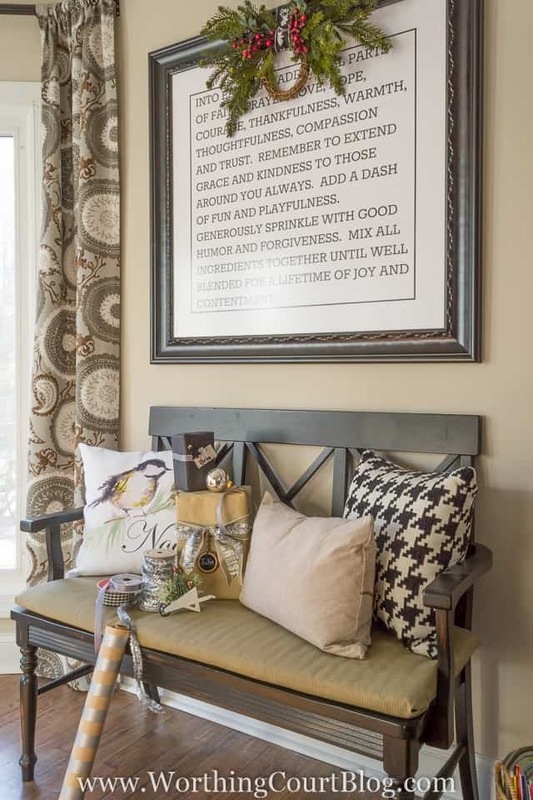 I still have the same bench and framed printable on the other side of the breakfast room. By the way, I made this large size printable and also a 9″ x 11″. It’s free, so click HERE if you’d like to download and print a copy. I called this printable Each Day. And lastly (bless you if you’ve stuck with me until the end! ), I created a simple centerpiece for the table. Thank you for letting me show you around my Christmas kitchen today. I’m sending my warmest Christmas wishes to you, your friends and your family as we all celebrate the joyous occasion of our Saviour’s birth. Thank you so much, Yvonne!. That means a lot to me coming from you! 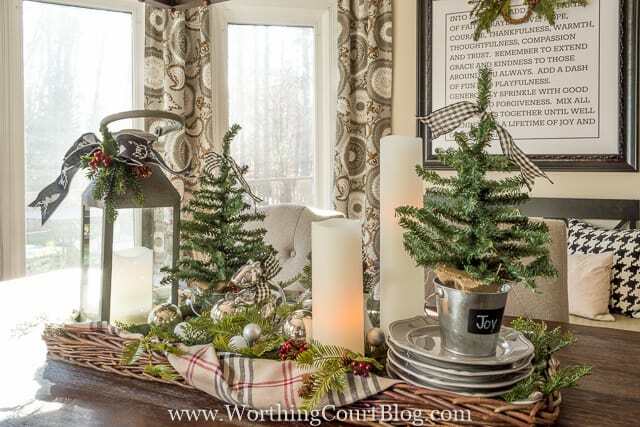 Love the Christmas decorating ideas! Thanks! 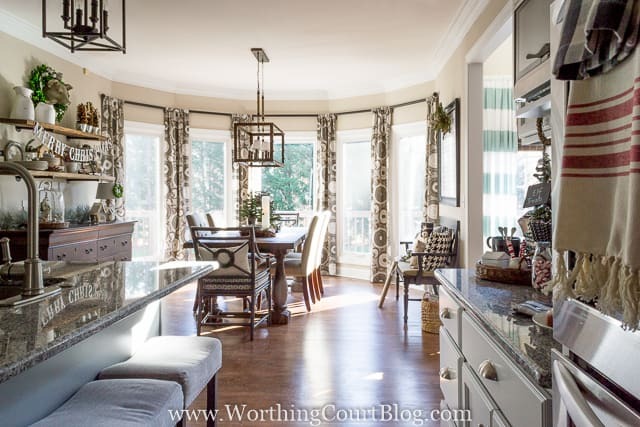 Suzy, your kitchen and breakfast room are beautiful! I love all your beautiful Christmas details! What a wonderful place to gather at the holidays. Thank you, Lynda! I hope you have a wonderful Christmas! suzy, it is all so stunning and beautifully styled for the holidays. What a fabulous room! So welcoming and warm and perfectly decorated. Thanks for sharing. Just Gorgeous! I am in love with your kitchen and all the decorations. Where if I may ask, did you get the bin that holds the Kuerig cups? I would love to do this on my counter as well. You have a great eye for decorating. Thanks for sharing it with us. 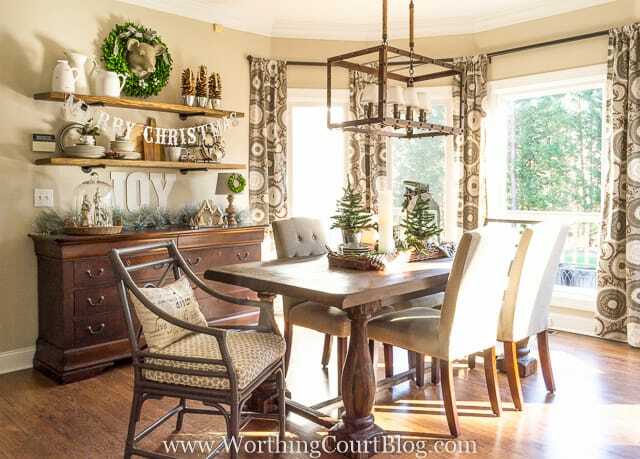 Beautiful kitchen and breakfast room dressed for the holidays, Suzy. Love the garland on the hood. Thank you, Kim! I hope you and your family have a wonderful Christmas! Oh GF you outdid yourself!!! Everything is just stunning!! Love all your little wreaths and I need to come see how you did your curtain rods to see if they would work in my master sitting room….that’s right I still haven’t finished it LOL. Let’s set up a time for that hot cocoa!! Thank you so much, GF. Looking forward to seeing you! Your home is beautifully decorated for the season!! The new curtains really do a great job at framing the area and view outside. Thank you, Darlene. I’m in love with those curtains! The entire kitchen/eating area are beautiful! I love it all! 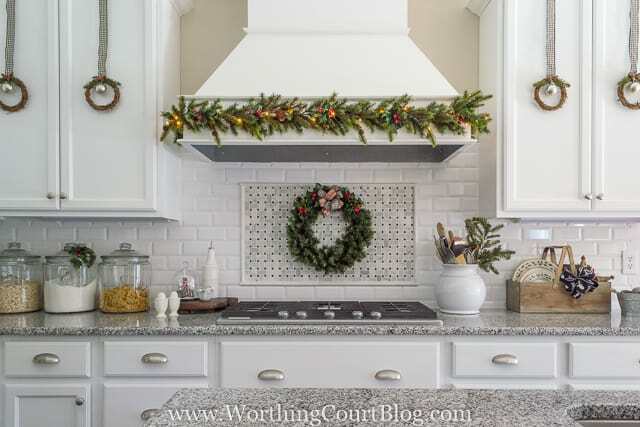 How do you keep the garland on the range hood? We have a new home and I would love to do that. Hi Tina. So glad you like my Christmas kitchen! I used Command Hooks to hold the garland on the hood – the clear small ones that are for holding light strands. Have fun decorating your new home! 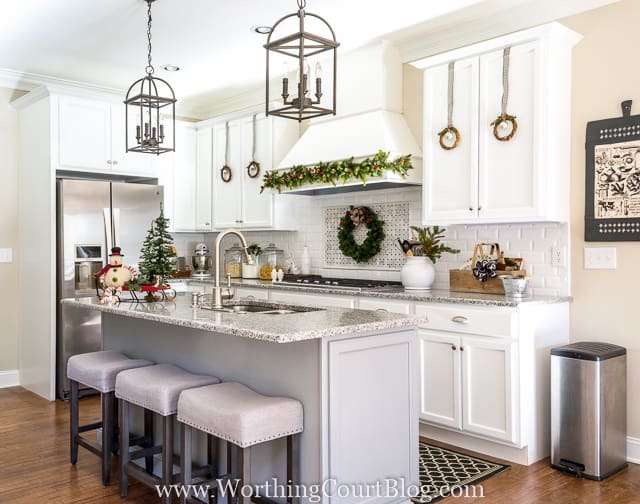 You have done an absolutely beautiful job of adding holiday cheer and warmth to your fabulous kitchen! 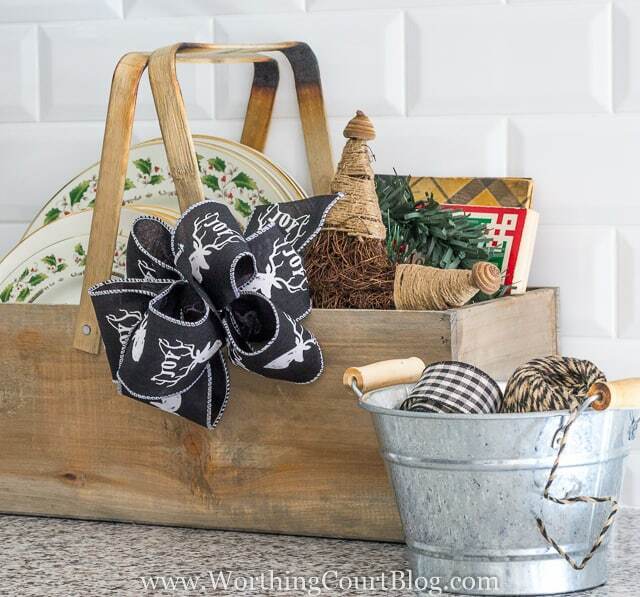 I love the black and white check and the stunning black chalkboard ribbons that you have used. 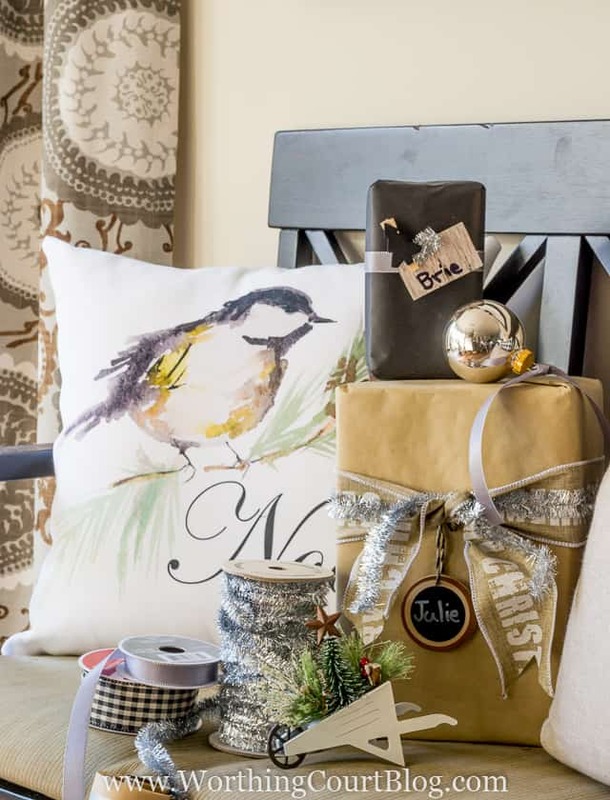 All your holiday touches were masterfully implemented! Thank you for sharing. Thank you, Cindy. Merry Christmas to you and your family! Thank you, Danielle. So glad you like my kitchen! Your kitchen looks lovely! 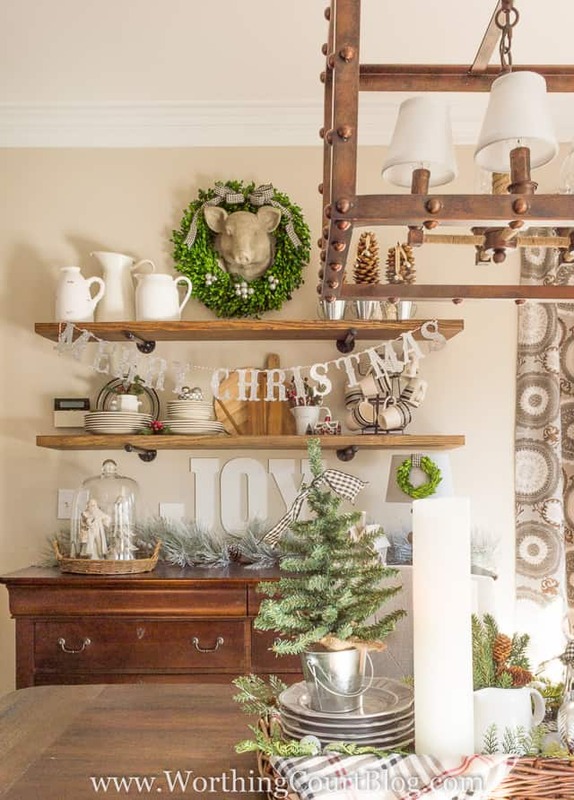 Love the garland on the fume hood… Especially the little lights add a nice touch! Your breakfast nook is beautiful too! Thank you so much, Angelina! The little lights were my granddaughter’s idea. Merry Christmas! Your kitchen is gorgeous and beautifully decorated. I love all the details! Thank so much, sweet Debbie! Merry Christmas to you and your family! Yowza Suzy, your kitchen is gorgeous!!! Love all the special touches you added for the Christmas season. I love your beverage station too! Merry Christmas! Thank you so much, Anne! I hope you and your family have a wonderful Christmas! Suzy beautiful! Don’t you just love it when it all comes together! I always love seeing your kitchen! It just looks stunning all dressed up for the holidays! Love the garland on the hood and all the beautiful details! Merry Christmas, Shelley! Thank you so much for your sweet comment! I so enjoyed seeing your Christmas kitchen! I believe that I have the same yellow and black plaid cookbook! “All About Baking ” was my Mothers homemaking book from high school! Merry Christmas to you and your family! Suzy I love every single square inch of your kitchen! It is all just gorgeous! Thank you, Vanessa! I hope you and your family have a wonderfully blessed Christmas! What a cozy kitchen! 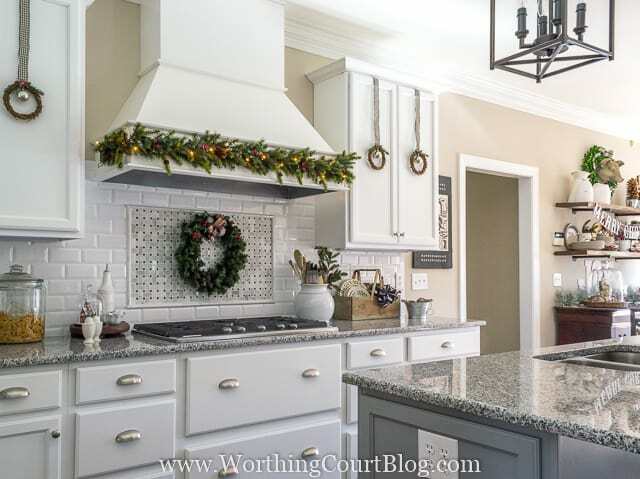 I love the touches of black and the wreaths on the cabinets. Thanks for adding your charm to the #OMHGWW Linkup. I am choosing you as my featured link, so look for your feature in next week’s linkup! Thank you so much, Shellie! And thank you for the feature! I’m honored and will be on the lookout for it. suzy your kitchen is amazing!!!! it looks beautiful decorated for the holidays- so warm and inviting! also not sure if it is just me but your header doesn’t scroll with the page and ends up taking up half of my screen so it’s harder for me to see your gorgeous home. i wanted to let you know. Thank you, Cassie! And thank you for letting me know about the header. Still trying to get the kinks worked out of the new blog design. I saw your next comment though, that says it was working properly. Merry Christmas! I love every nook and cranny of your magnificent home! I enjoyed looking at each of the different rooms! Just fabulous! 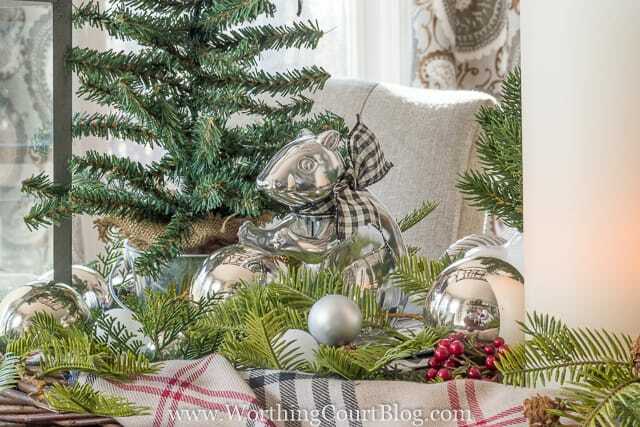 Thank you for joining the 12 days of Christmas Blogger Tour Link Party! Merry Christmas! Hi Nancy. Our kitchen is 13′ wide from wall to wall. Each one of the counters is 25″ deep and the island is 36″ wide. The island is slightly off-centered to give a few inches more space between the island the the wall that the wall ovens are located on. Let me know if you need any more info and I’ll be glad to provide it. Good luck with your remodel! What a beautiful kitchen! You are very talented. Suzy, thank you so much for your reply. Alas, I tried 3 different Michael’s stores and not one. Maybe one day I will get lucky. I will just keep trying. It was so sweet of you to share that information. I am still in love with your kitchen. I’M a new follower to your blog and am hooked! Your house is beautiful and an inspiration to me. I just started decorating my home and am by no means a decorator but with your ideas I’m sure I can fake my way through my house. I’ve searched your blog to see where your kitchen pendant lights came from?? Hi Michele. My kitchen lights came from Home Depot. 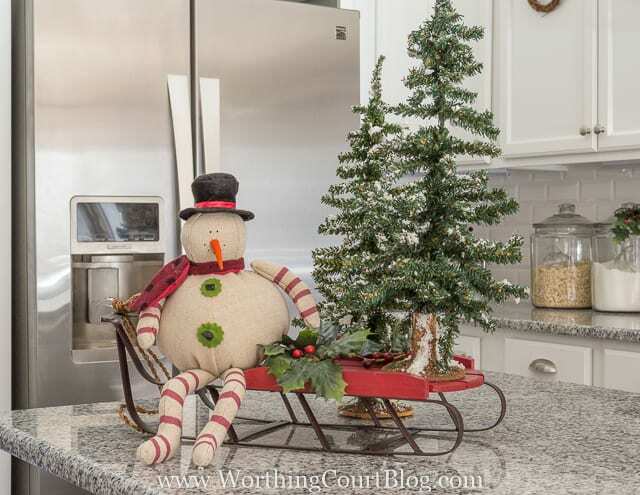 Love, love everything ~ Where did you find the small trees on your counter with the snowman? Gosh, Rita – I’ve had them so many years that I don’t remember where they came from! I’ve seen similar ones this year, though not quite as tall, at Hobby Lobby, Michael’s and Target (I think). If you want the snow effect, you could always add some spray snow that comes in a can or even spray paint them with a little white paint. Suzy, your kitchen looks amazing! I love the black and white Christmas accents and your coffee/cocoa bar. AND your table centerpiece! 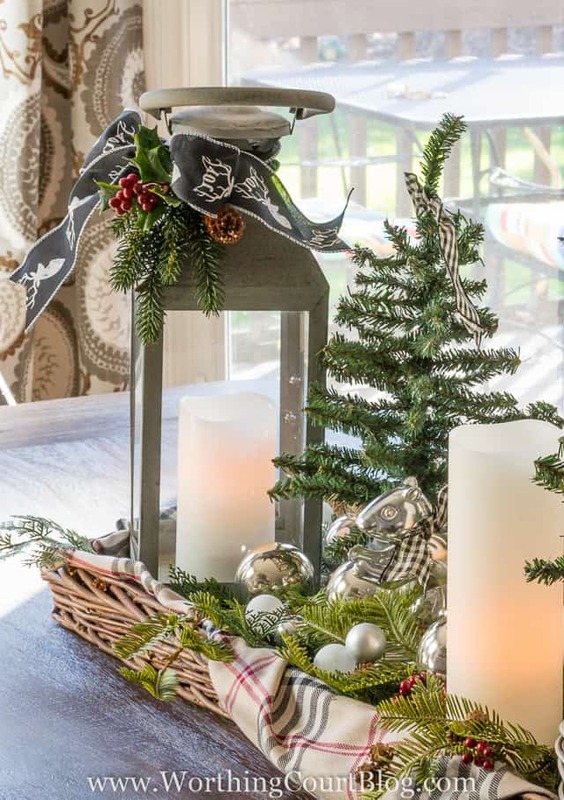 I love lanterns and anything rustic…this will be an arrangement on my table this year! Thank you for sharing your beautiful kitchen! Love everything! Stunning and fabulous! And so inspiring! 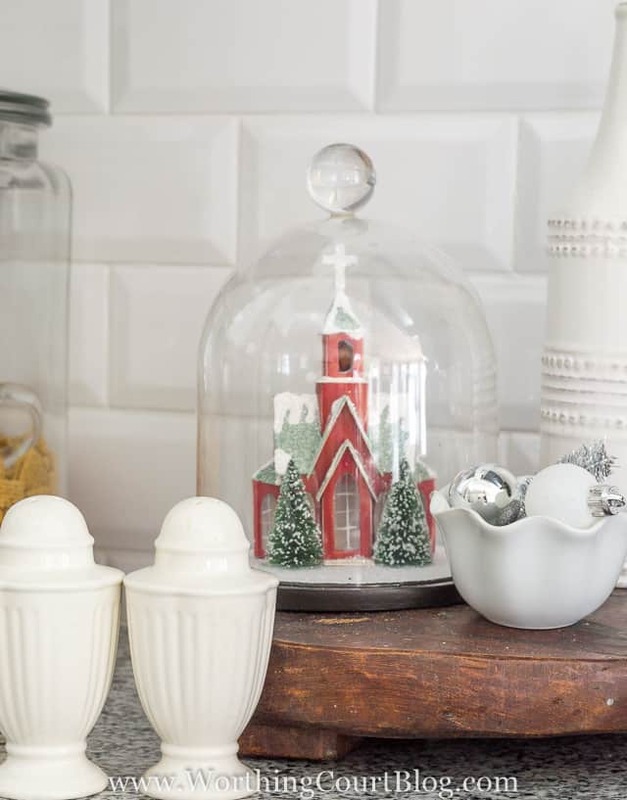 Your kitchen is beautiful and so ready for the holidays. I love all the greenery and wreaths. You inspire me. Love the black and white touches. Such a classy kitchen and breakfast area! Yummy. 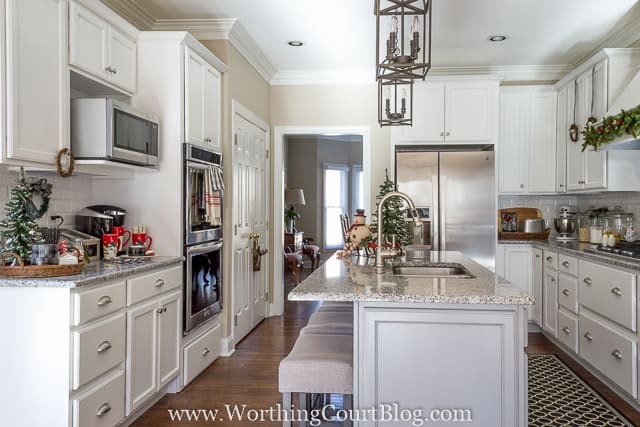 I love your kitchen…just stunning! 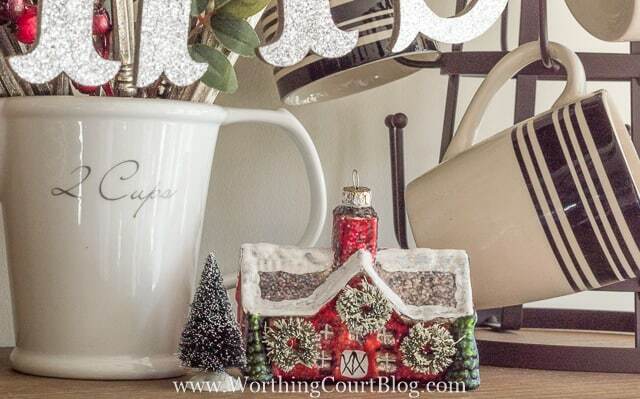 I will be stealing the idea of tiny wreaths with a single ornament hanging on the cabinet doors…adorable! Beautiful! I could see myself having morning coffee at the table. Its bright and cozy. What shade are your walls in the breakfast nook. I love your choices on everything! Very nice! Hi Cathy. The walls are painted with Sherwin Williams Accessible Beige. Have a great day! I love everything that you have done. It makes me want to visit. I hope you have a wonderful holiday season. I enjoy your blog. Your kitchen is lovely and very inviting. Now you must have a nice brunch for friends. My kitchen /dining has the same layout as yours and it is my favorite room in my house. Merry Christmas and may the Lord bless you and yours this Christmas and throughout the New Year. 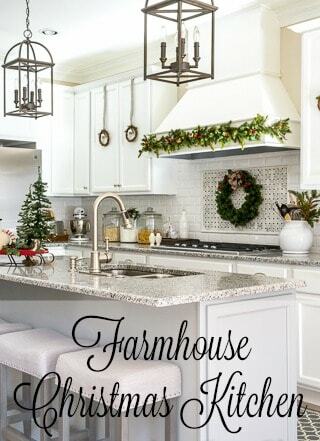 Mrs. Suzy your Farm home kitchen is beautiful and i did love what you have done so far!please keep your wonderful and beautiful ideals a coming, and i can not wait to see more of your gorgeous home, and your kitchen is so beautiful! Your kitchen is like “a dream come true”. I love the Christmas decorations in the kitchen. I am stumped as to what to do with the kitchen other than the countertops. Yes, the “Merry Christmas” garland looks perfect. I also adore your “Joy” sign. You have so many talents. Your kitchen & breakfast nook are beautiful!!! 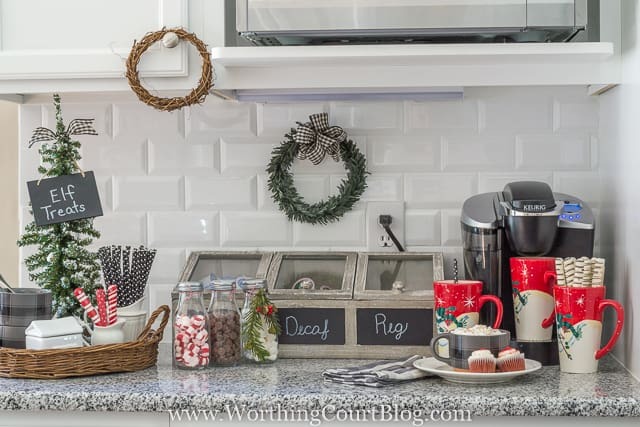 I love the little wreaths on your cabinets and the black & white ribbon! What is the granite called on your counters—similar to mine on my island. Also, where did you get the oiled bronze brackets your shelves are on? I am looking for something similar but w/out success. I too have a b & w kitchen! Love them. What a beautiful kitchen you have! love what you have done & all of your Christmas decorating & special touches. Love the drink/hot cocoa bar!! Great job! I love all your Christmas touches. Wow, it all looks so beautiful. I just adore all the things you do. Beautiful kitchen, love the coffee bar and the box that holds the K-cups. Where did you find that? I love the size of this kitchen, it is compact to make the work easy and quick. Love the eating area with all those windows. I could sit here all day, gazing out the window. I love your breakfast area! What is the color and brand of paint you have on the walls? Thank you! The walls are painted with Sherwin Williams Accessible Beige. Where did you get your dining table?? Yesterday, I was looking through magazines as I waited for my prescriptions to be filled. I was thrilled when I came across your article. Congratulations~nicely done. Thank you for sharing. As always, you encourage me!